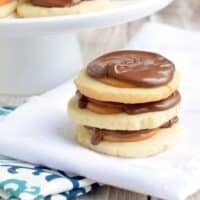 These Twix cookies have a buttery shortbread cookie base with creamy caramel and chocolate on top! I’m not even kidding when I say they are addictive! I don’t make enough cookies for the blog. I make a lot of cookies at home…but the blog? Nope, not too many new recipes around here for cookies. See, it’s a #foodbloggerproblem. I spend a lot of time creating new recipes for my family to enjoy…for breakfast, dinner and dessert. Of all the new recipe development, it’s not often that you see the same recipe in my kitchen. Unless it’s a family favorite. Except for cookies. When it comes to cookie baking, I tend to repeat some of my favorite recipes. I make most of my cookie recipes ALL THE TIME. Repeatedly. Because we love them. And many times I’ve got bags of cookie dough in my freezer from previous recipes. So that’s why you don’t see new cookie recipes very often around here. However, when you do…TRUST me that it’s going to be a keeper of a recipe. It means that it was delicious enough to make the cut. Actually, to be honest, I only share the best here on Shugary Sweets. There are so many fails in my kitchen. Or recipes that were good…but not great. So know that if I’m sharing a recipe, it’s something my family LOVED. These Twix Cookies fit that bill. We loved them. One thing is for sure, I’m no stranger to Twix candy bar cookies. I’ve also created these easy Twix Cookie Bars if you prefer to skip the individual cookie baking. Plus, they resemble a candy bar right? Make your shortbread dough ahead of time. Roll it into a tube shape (the size of a paper towel roll). Wrap it up in plastic wrap. I actually will cut an empty paper towel roll lengthwise, and place my plastic wrapped dough inside the tube. Then refrigerate. The paper towel tube helps the dough keep it’s rounded shape. Slice and bake your cookies. I usually cut the dough in half. Return half to the fridge until ready to use (so it doesn’t come to room temperature). Baking the dough while cold is KEY to a delicious, flaky crunch.
. They are easy to pour into a bowl and melt in the microwave. If you can’t find them, you can unwrap caramels, that works too. I used a small metal scoop to place caramel onto the cookie. 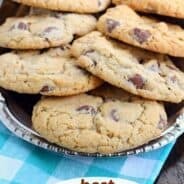 Use a good quality chocolate on these cookies. I tend to buy Ghirardelli milk chocolate chips for these, as they taste delicious! They also melt smooth in the microwave. 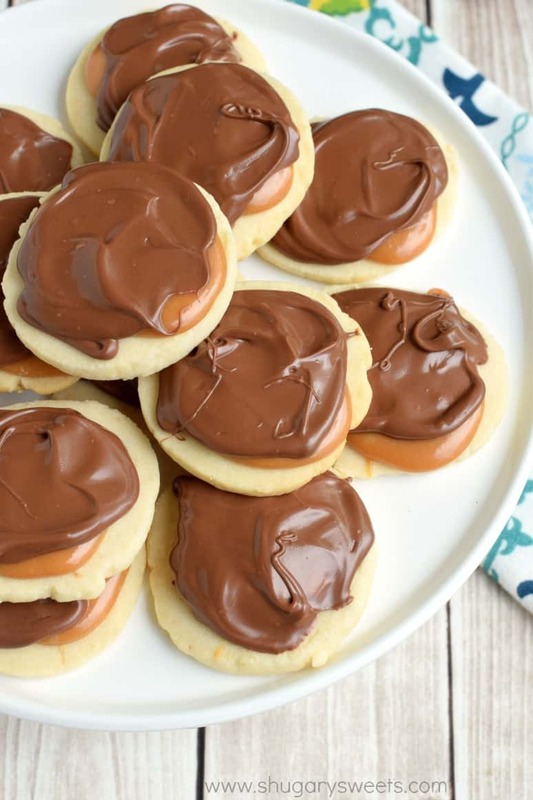 Love these Twix Cookies? You may also love these…. 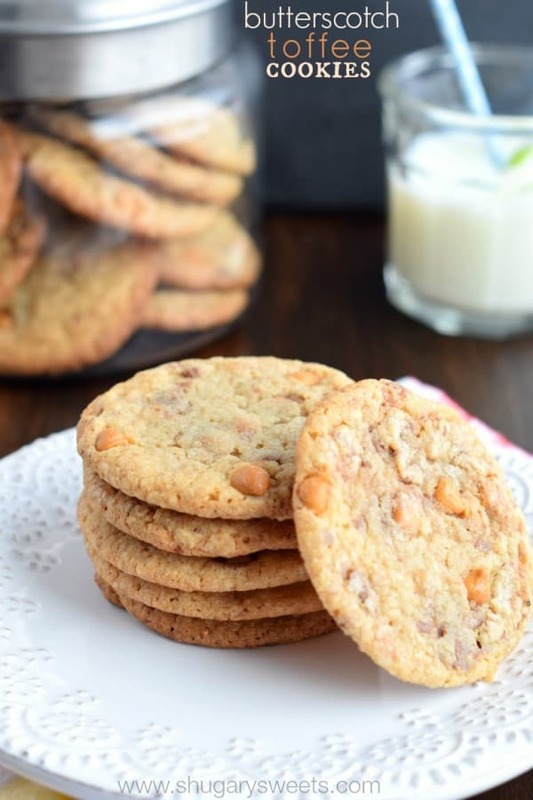 Butterscotch Toffee Cookies: chewy and perfect. This recipe is a home run! 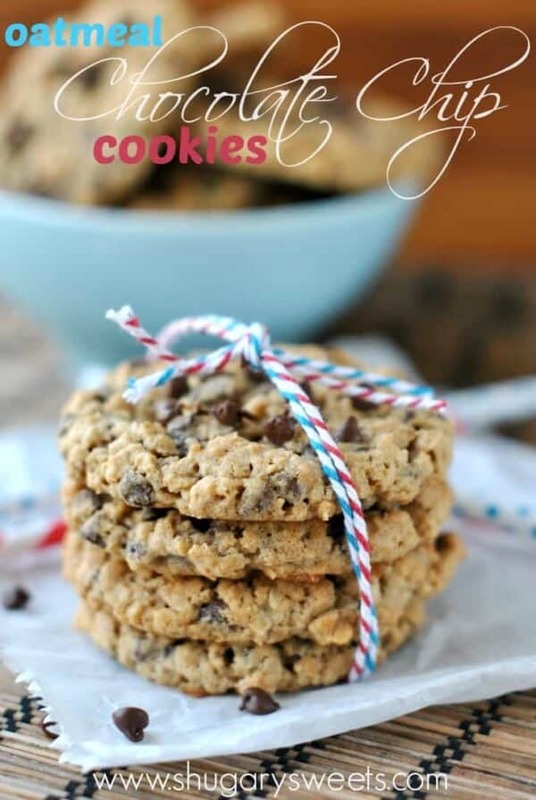 Oatmeal Chocolate Chip Cookies: no raisins in these, that makes my kids happy! 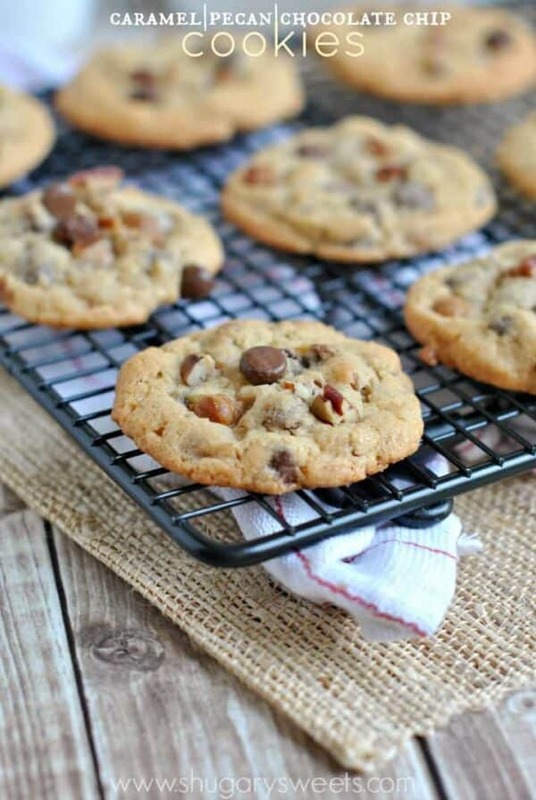 Caramel Pecan Chocolate Chip Cookies: one of my favorite cookies. EVER. Flaky shortbread cookies topped with creamy caramel and rich chocolate! In a large mixing bowl, beat butter and powdered sugar for several minutes until well blended. Add in flour, salt and vanilla. Beat for 2-3 minutes until dough starts to form a ball. Drop dough onto a light floured surface. Using your hands, shape into a log, about the size of a paper towel tube. Wrap in plastic wrap and refrigerate at least 30 minutes. Slice dough (about 1/5 inch thick) and bake on a parchment paper lined baking sheet. Bake in a 350 degree oven for 11-13 minutes, until edges set and begin lightly browning. Do not overbake. While cookies are cooling, add caramel and whipping cream to a microwave safe bowl. Microwave for 1 minutes. Stir and heat again for 15-30 seconds. Stir until smooth. Using a small metal scoop, drop about 3/4 Tbsp of caramel into the center of each cookie. It will spread on it own. Melt milk chocolate in a microwave safe bowl for 1 minute. Stir and heat an additional 15-30 seconds if needed. Frost the tops of each cookie and allow chocolate to set (about 30 minutes). Store in airtight container at room temperature. ENJOY. 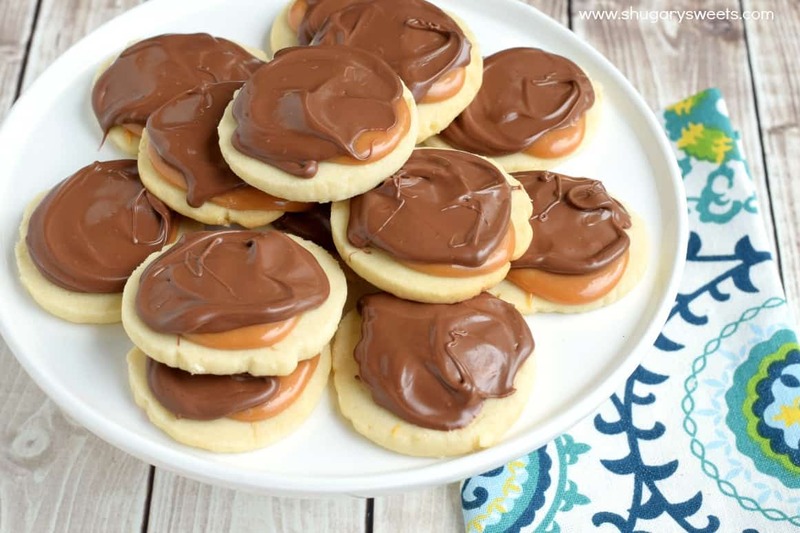 **This recipe for Twix Cookies was originally published on Shugary Sweets on May 11, 2015. The text has been edited and updated, and republished in April 2018. This is NOT the first thing I need to see on Monday morning, Aimee! Now I want Twix Cookies with my cup of morning coffee. These look incredible. 🙂 The chocolate and caramel layers are absolutely perfect! Thanks so much for the cookie love, too. Now I’m off to think about how soon I can make a batch of these. 🙂 Pinned! I was drooling over the photo you posted on instagram of these! I love how bright your photos are too! I was just thinking that it had been awhile since doing cookies for the blog too…it’s time for a new cookie. 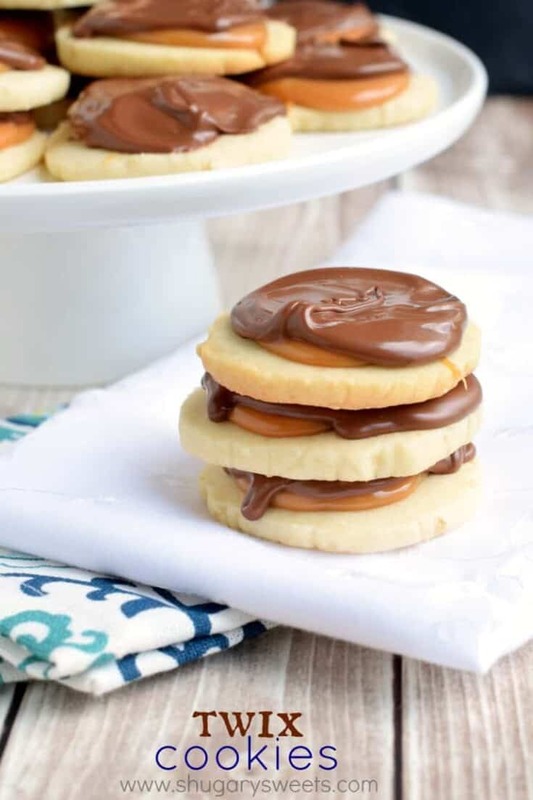 I love the layers in these Twix cookies…so fun and delicious looking! I can see why your family loved them! But, these cookies would definitely be getting made ova and ova…that drippy caramel? MY LIFE. Pinned! Dinners and Cookies I make repeatedly. Other desserts? Rarely. As there is always something new to try 🙂 Thanks for pinning Taylor! Those look amazing. I love Twix so I am sure these will be a new addiction for me. Wow, these look incredible, just incredible. I love Twix, I’totally sure I’d love these cookies. Well done! Twix is easily one of my all-time favourite candy bars. Love love love these magical cookies! I’m seriously not surprised by this brilliance! Everything you make is addictive! I give you props for repeating recipes. We could never eat that many cookies. Well, I could. 🙂 LOVE these! Twix are one of my favorite candies ever, so yesssss pleaseeee. Sooooooooo bad right now I wish I were eating some of these cookies. They are perfect! Yep, I’m officially obsessed with these! They look so tender, buttery and perfectly Twix-y! Twix are one of my favorite candy bars! I would love to be in your kitchen when a fresh batch of these cookies come out! Repeating recipes is so impressive, Aimee! My son always asks for this one PB cookie I made once over and over again, and I do it for him, but I’m groaning on the inside because I feel all the pressure to bake new cookies. I can see why these are a favorite. They are AMAZING. So much happy caramel! These cookies are too good to be true! And they should be illegal. Arrested for too much amazingness. But I love them! They really do look deliciously sinful 🙂 Great recipe, Aimee! Man, I love Twix’s! And Twix cookies?!?! Marrying two of my favourite things ever together – you’re a genius and I simply must make these! Aimee, these cookies look to die for! I’ll never be able to eat a Twix bar again (because I can already tell I’ll be disappointed that it’s not these cookies). Making these ASAP! Thanks Joan, they are quite good….although I’ll still eat a Twix bar, haha!! These look incredible, Aimee, and I can’t wait to make them! Want to make but I am confused by this ingredient! Could a thick salted caramel sauce substitute the Kraft caramels? The melted caramels harden slightly back up after spreading on cookies, not sure a caramel sauce would do the same? Unless it were homemade, maybe? Aimee, these look so yummy!! I have a question, tho. 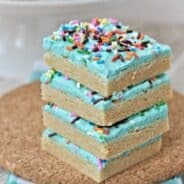 I don’t bake, from scratch, very much and was wondering if this recipe can be used with the refrigerated sugar cookie mix from the store? haha, no worries!!! Thanks for tweeting! Can you bake the shortbread cookies ahead of time and freeze them then add the caramel and chocolate later? Can you substitute the heavy whipping cream with something? I wouldn’t free them with the caramel and chocolate on them. These look amazing! You might also be able to add a few peanuts between the layer of caramel and chocolate….and then they’d be Snickers cookies?? 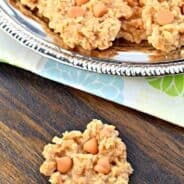 This recipe is so similar to a cookie my Grandmother has always made. She called them diamond cookies and cut them in the shape of a diamond. She always puts a m&m, pecan or walnut on top. My preference is the walnut. It helps to cut some of the sweetness since they are so rich. It’s one of my very favorite cookies. I made some at Thanksgiving and I should be embarrassed to say this, but I think I ate most of them. Can I use homemade caramel on these? do you think they will harden properly? It depends on the caramel recipe. Some homemade caramel makes more of a sauce. But if you have one that sets up like caramels that you wrap, then definitely it would work! I made these twix cookies for my work on Sunday and they came out perfectly! I went to go make some for my family today and I noticed that when I made them on Sunday, I only added 1/2 cup of butter (1 stick), instead of 1 cup (2 sticks), but they still came out right. So today I did the 2 sticks of butter and the shortbread dough was super “runny” almost. When I only used 1 stick of butter on Sunday, the dough was perfect and came together like a ball. But 2 sticks made the dough thinner and really sticky and hard to work with. Did using 2 sticks of butter mess up the dough, or did I just do something wrong? I ended up throwing out the dough and remaking it with 1 stick and it came out perfectly again! Also, is there a way to make the caramel a little smoother. Every time I make these cookies, it’s super hard to spread the caramel on. Any tips? Gonna try this this soon. heading to the market to get the above mentioned ingredients.